San Diego has one of the oldest and two of loveliest missions in the state. For a classically-themed wedding photography session that hearkens back to the early days, start at the Missi'n Bas'lica San Diego de Alcal', the first mission built in California by father Jun'pero Serra. Truly romantic pictures are easy to take as the storybook courtyard and garden invite you to suspend yourselves in time and enjoy the beauty all around. Pose for romantic bride and groom pictures by the stately fountain surrounded by swaying trees and bathed by soft light. Have your photographer assemble your entourage before the soaring walls with the bell tower rising up to the blue sky, and find many more fascinating settings all around you'such as the long galleries and arched wooden doors'all infused with the grace and history of this lovely location that will definitely provide for inspired, stirring images. Next, uncork the bottle of champagne that's waiting in your limo and take the fairly short drive to North San Diego where you'll find Mission San Luis Rey. 56 acres of land and spectacular gardens bordered by the mission's whitewashed adobe walls provide a peaceful oasis for magnificent wedding day photos. Assemble your entourage together under the shade of the first pepper tree planted in California in 1830 and look forward to the future as you gaze into each other's eyes. You'll find many romantic settings in the Sacred Garden for sweet, pensive portraits. And make sure you stroll over to the Lavanderia, which used to be the open air laundry area and now provides a marvelously different location for unique and distinctive wedding day photos. Note: The missions ask for a donation but it is well worth the small fee as you gain access to timeless settings that will provide you with priceless images. 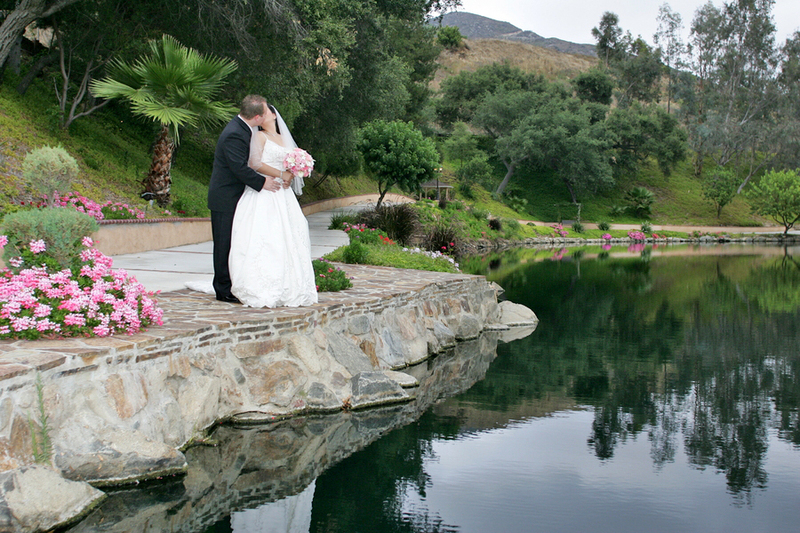 Start your wedding day photography session at the Rancho De Los Pe'asquitos, where a delightful courtyard complete with a burbling fountain, shaded galleries and tranquil grounds offer dozens of opportunities for outstanding wedding day photos. Stroll about the grounds of this gracious home and the lovely preserve that surrounds it and go back to a place when time moved at a more tranquil place as your photographer captures these moments forever. Your next stop is at Rancho Guajome Adobe ' a stunning example of early California adobe ranchos. Rancho Guajome has been faithfully restored and offers park-style gardens, galleries and tranquil courtyards where you can pose for intimate closeups and charming group portraits. Surrounded by wetland open space, there is a definite country feel to this beautiful location that makes it a popular location. Wrap up your wedding day photo session at a surprising location right in the heart of the City. Presidio Park offers natural and inspirational settings for many memorable pictures. Park inside the Park grounds at the Presidio Dr. parking lot and walk the short distance to Inspiration Point, where grassy alcoves are nestled into the hillside and lush green lawns are bordered by a view of Mission Valley. Stroll over to Palm Canyon where you'll find dappled light playing on the quaint little bridge of this hidden gem. Then wrap up your session at The Padre Cross, built nearly a hundred years ago with tiles from the original Presidio and situated in a tranquil and cozy spot in the park. This is great place to capture traditional images that you'll definitely want to share with family and friends! If you're looking for pictures that reflect your spontaneity and joie de vivre, get your session going with a visit to Seaport Village and indulge in some fun! Head straight for the historic carousel, created by the renowned Charles Looff in 1895, and pony up for a ride on the hand-crafted horses as your photographer captures the joy the two of you you're feeling. If you have a bit of time stroll around for however long you can and laugh, love and live in the moment as you create spontaneous snapshots and romantic portraits that will always make you feel young at heart. And when you're ready you don't have to go far for something really different ' how does a romantic downtown Carriage Ride sound? It is your wedding day after all, so indulge in a 30 minute Waterfront Ride (or longer if you have the time!) You can either walk up and ride a standard carriage'or call to reserve a special carriage ahead of time'then simply relax as you toast your future with a glass of sparkling champagne that you just happened to bring along for the ride. Wave at all the well-wishers passing by and pause at a few select spots to capture memorable wedding day photographs in this remarkable City.